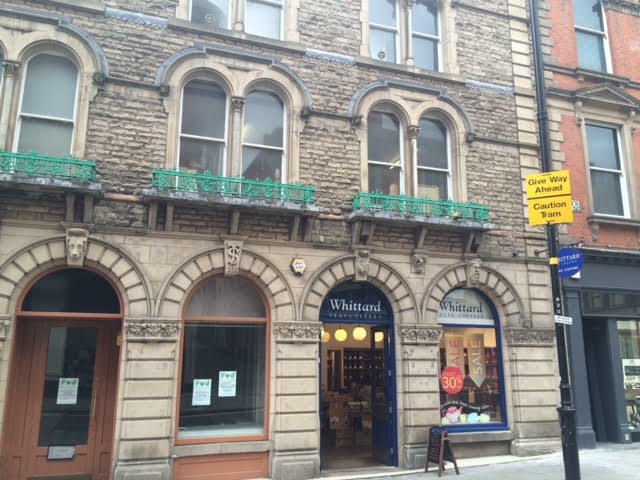 Bridlesmith Gate lies at the heart of Nottingham's fashionable quarter. Jack Wills nestles near to Diesel; Flannels close to Ted Baker; and Paul Smith's quaint original shop lives on just a stone's throw away. Number 4 Bridlesmith Gate stands towards the St. Peters' Gate end of this now pedestrianised street, squeezed between a tea shop and the Body Shop. The attractive stone 1876 premises were once a pub, with the original landlord's initials carved into the stone; the Dog & Bear was later to attract a rowdy reputation. 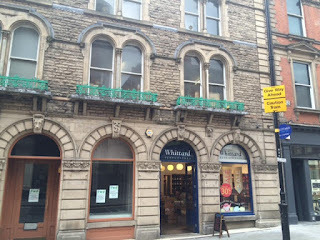 Part of this Grade II listed building also came to house Nottingham's first ever radio station, 5NG, provided by the new British Broadcasting Company. Its studio stretched out about 18' x 35', equipped with a large, lonely microphone. A second microphone was reserved for outside broadcasts; and a gramophone was on-hand for the playing of records. The B.B.C. 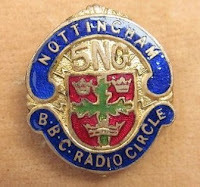 's hasty initial strategy comprised the assembly of a network of local stations, with Nottingham being added to the map as the sixteenth outfit on a damp Tuesday September 16th, 1924. The 5NG signal was transmitted from an aerial dangling from a chimney on Noel Street. Mr. J. C. W. Reith (Managing Director B.B.C.). 9.50. The Bend. S.B. to ""
Bonny Boy" ; (3) Folk Song from Somerset. The launch was an ambitious affair, heralded by a live outside broadcast from the Albert Hall with the RAF band providing an opening segue. Accordingly, for the record, Wagner's 'Flying Dutchman' Overture was the first tune to be played on radio in Nottingham. Such was local enthusiasm, attendance exceeded the 1600 capacity and some unfortunate souls were left out in the rain enjoying a relay from loudspeakers at the Arboretum, kindly sponsored by Pearsons of Long Row. As the applause subsided, the B.B.C. 's inexperienced MD, John Reith, uttered a few encouraging words; followed by the Mayor and the Sheriff doing much the same thing. After another burst of music, the switches were flicked and the citizens of Sneinton, Sherwood and Southwell witnessed their first late news from London crackling down the line. Those network bulletins were a relatively new affair: until the year before, content had been dictated by telephone from the London station to its patient little sisters across the country. The station had been established as the fifth in a series of low-power relays around the UK, with 5NG supporting the larger 2ZY in Manchester from which it was fed via a telephone circuit. The relays operated at 200 W, compared to 1.5 kW for the main stations, together claiming to reach 75% coverage of the UK population; more than the first tranche of commercial radio (ILR) in the 70s; and about the same as the proposed second national DAB multiplex from Sound Digital. 5NG transmitted variously on wavelengths of 322m, 326m or 275.2m medium wave, as the Post Office mandarins pulled out their hair trying to make sense of the growing enthusiasm for broadcast spectrum here and overseas. There was a proportion of evening local programming too, amounting to 2,782 hours in the first year. The jaunty 'Children's Corner', was a popular element, affording a stage for a host of local 'aunties' and 'uncles'. Auntie Ruby was in charge, who, by day, was Ruby Barlow, a solicitor's wife with theatrical leanings. Laurie Bagshaw was also much-loved by the 5NG team and listeners alike. Known for having 'racy friends', few knew how he actually earned a living, but he appeared to have sufficient free time to help manage the whole affair. Lest older brethren felt excluded, the schedule also dutifully featured 'corners' for others, including "Scouts' Corner" and "Teens' Corner". Local press engaged fully, with no hint of paranoia about the fledgling medium. 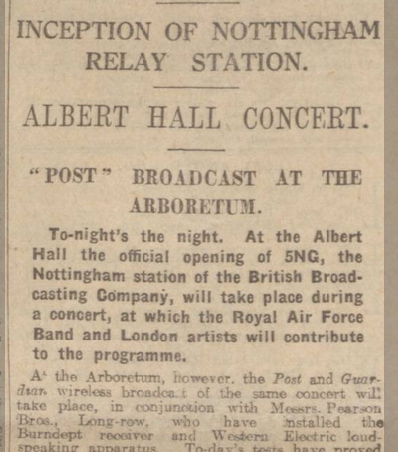 In a regular '5NG attractions' column, one sub-heading read 'Some Good Programmes Next Week', beneath which the Nottingham Evening Post trumpeted a special local concert on-air featuring 'entertainer Stainless Steven'. 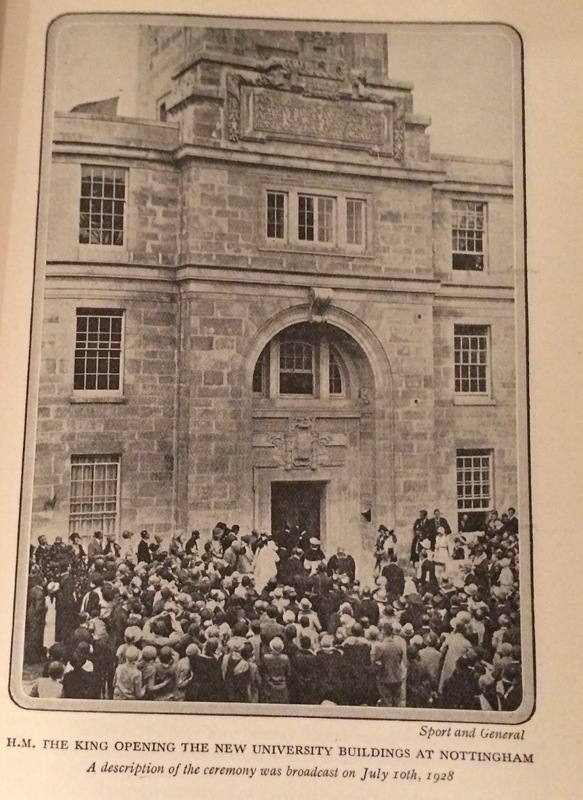 Outside broadcasts included the first ever radio coverage of the opening of Goose Fair on 1st October 1925; and the King opening the new University buildings on July 10th 1928, after which the City's Mayor became a Lord Mayor for the first time. 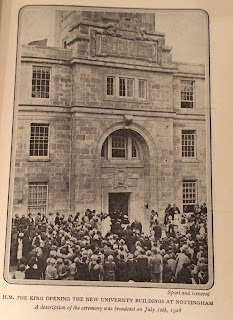 Much excitement ensued when annual gatherings of 5NG's 'Radio Circle' were beamed from the old Exchange Hall. A Mapperley lad made his debut on 5NG at the age of 12: Cyril Stapleton, who became a well-known violinist and bandleader, eventually playing with Henry Hall, the LSO and even on some Frank Sinatra tracks. As a schoolboy on 5NG, he broadcast in scholars' concerts "Master Cyril Stapleton (solo violin)". Home made crystal sets were painstakingly assembled with long makeshift aerials to receive the signals from near and afar. 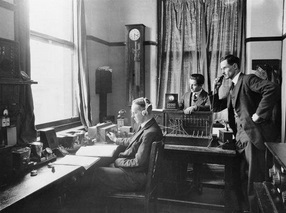 The Nottingham Evening Post kept listeners abreast; and a radio column called "Wireless Whispers" was duly introduced. 5NG reception reports came in not just from Nottingham but also Loughborough, Lincoln, Leicester and Derby. Listeners were even tempted to invest in an expensive valve set, costing as much as 7 pounds. "It is three years since the Nottingham Relay Station was first opened, and from that date began a revolution in the artistic life of the city. So much a part of the life of the community has Broadcasting 'now become that it is difficult to imagine its absence. In these three years more than 40,000 licences have been taken out in the Nottingham area, which has as many and perhaps more listeners per thousand of the population than any other centre of the B.B.C. activities. How has this been achieved?" "Nottingham is not renowned as a musical town, and yet musical artists of all kinds have offered their services for Broadcasting. The encouragement given to promising artists has been no small factor in building up the popularity of the Station. In addition to routine concert work, a number of popular community singing concerts have also been given from which local charities have benefited. Outside Broadcasts of events of civic importance have been a regular feature of the programmes." "Broadcasting has come to stay. The B.B.C. has set up a standard in Nottingham which must never be lowered in any way. Radio is quite as much a part of the daily life of the people as the newspapers, a position which must be kept and consolidated". Life was not to be so simple. As technology advanced, 5XX on Long Wave, eventually from Daventry, took over; and 5GB supplied a Medium Wave service to the Midlands. National and regional radio had begun. 5NG was no longer needed. The function of a relay station had become defunct; and its serendipitous emergence as a commmunity service was disregarded. The pleas went unheeded. It was decreed that networked programmes should replace local ones. 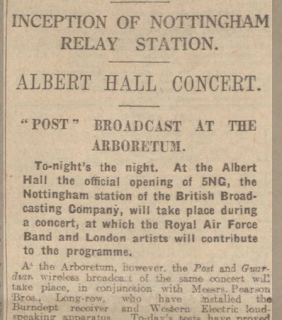 Nottingham listeners were placated by assurances that their local talent would enjoy a bigger audience from the regional transmitters; and that programme quality would be higher. Uncle Laurie and Auntie Ruby promptly defected to Birmingham; and 5NG turned off its valves on 31st October 1928 – after just four years. It was to be four decades before local broadcasting returned to Nottingham. 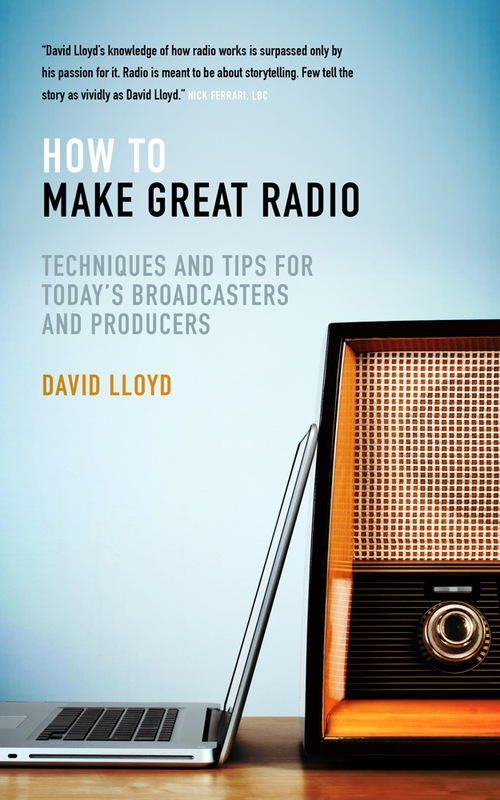 My book 'How to Make Great Radio' is published by Biteback. Proceeds to the Radio Academy. My old man is 94. 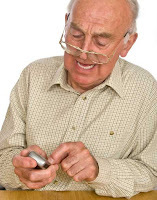 He loves his mobile phone and his iPad; and merrily plays Olly Murs loudly from YouTube. He banks online. He's not old-fashioned. And he says he doesn't feel old. Whilst he likes Olly and Leona Lewis; he also enjoys Doris Day and the harmonies of the Beach Boys. Whilst he talks readily about iTunes passwords, he also remembers the reg numbers of his old Ford Capri. He likes Sam & Amy on Gem 106; and talks about Radio Luxembourg. Before his sight caught up with him, he relished this week's adulterous Coronation Street as much as old sepia episodes of Upstairs Downstairs. BBC Local Radio rightly does not not want to sound 'old-fashioned'. It is crucial, however, that it fully acknowledges the tastes and interests of an older audience. Those two objectives are mutually compatible. At a time when the BBC calmly considers how to revive the BBC Local audience, I do hope it does not mistake relating to an older audience for being old-fashioned. Playing more current songs and introducing more contemporary talk topics is not the way to a happier Rajar day. BBC local listeners do not want a stuffy, dated, dull service; yet they do want content which relates to people like them. In the outside world, fifty-somethings will find the greatest pleasure knocking about with friends their own age. Their life span and cultural references will co-incide; and they will share the same language, the same memories, the same smiles. They share the same country. They certainly will not feel old; they may have ambitions and things they still wish to achieve - and a healthy interest in the here and now. But they will also have the benefit of boasting a lifetime of memories and experiences from which to draw. They will likely have settled in a place they call home and started to take an interest in how it has changed around them. They will care about things which a twenty-something would not; and they won't be too concerned about the youthful twaddle causing grief for that twenty-something. Given BBC Local Radio provides the first step for many broadcasters, one can look around many stations and see rather more fresh, young faces on the coal-face than seasoned presenters and producers. Some of them likely know the area less well and won't hang around too long before they are whisked off on some exciting attachment. I do not recall the DG standing up in BH and announcing targets to encourage a workforce which reflects the demographics of BBC Local Radio's audience. Yet is not a daytime line-up of twenty-somethings as perverse as a Radio 1 line up of sixty-somethings? Radio hosted by someone over 50 can still excite. This must pose a challenge for BBC Local Radio. It is often through these young faces that the content funnel operates on a daily basis. These promising, intelligent young staffers are charged with ascertaining whether or not the death of a celebrity unknown to their generation is news or not - and pronouncing their name properly. They are charged with answering the phones to people often thirty or forty years older than them and trying to establish the worth of that caller's topic. And, on-air, those young broadcasters face the challenge of bantering with someone old enough to be their mother or grandmother, likely missing the nuances and opportunities for interest and entertainment. An old person can remember what youth is like, a young person may never know how maturity feels. As a fledgling broadcaster, I recall trying not to give away my age to the listeners. They were generally about 30, I was 19. Painfully aware of the gap, I did my best to focus the content appropriately; and was pleasantly delighted when listeners looked shocked at my acne when they met me. I'm not sure I could have managed to bridge any greater a gap. If you can; you're very good. Grown-ups don't want to be spoken to like kids. I worry about the focus of some BBC locals. Love songs and romantic messages really don't work as they do on younger formats. Topics of 'who did you have on you bedroom wall' are best not kicked off by a presenter monologue about their New Kids on the Block poster. 50+ listeners are not as obsessed with Twitter as twenty-somethings: only 6% of 55+ are 'hooked on social media'. 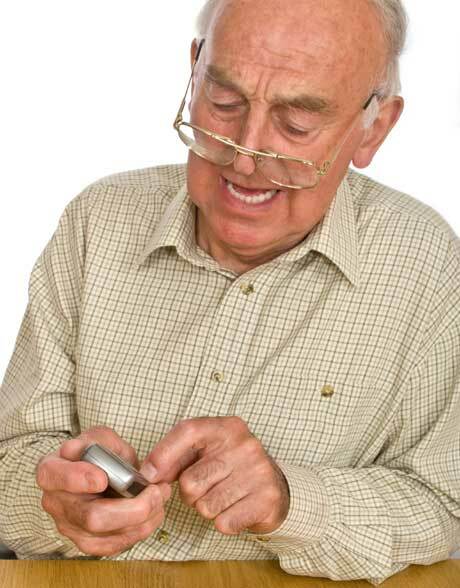 90% of 55+ do not regard the smartphone as the most important way of using the internet; but they will smile when you mention the days of having to rely on just just a single phone hard-wired into their cold hallway. Well over half of 50+ do not bother with a social media profile of any sort: they know what they are, they're just not as obsessed*. They will likely love the satellite TV choice now available, but it won't seem two minutes since it was a choice of watching BBC1 or 'the other side'. 50+ listeners do not share the presenter's enthusiastic schoolday memories when they hear a song from the 1990s. They feel that the 1980s seems actually quite recent. The most recently a 50+ slipped their 'first record' delicately out of its sleeve was likely 1978. For the majority of the audience, it was much, much longer ago. Great radio is relatable - and relatability is about identifying and sharing common ground. And, notwithstanding the BBC's laudable intentions with the excellent Make It Digital Traineeship, I'm not altogether sure why their local stations are being asked to carry trails aimed specifically at 16-24s. Whilst news bulletins on these local services will rightly be a little broader in their appeal, does the newsroom really attach due importance to the likely audience as it determines the news agenda for bulletins and the speech-heavy shows? Does it pause to review material in the context of someone born in the 1960s and before? I can hear the local filter on-air with enviable excellence; I am sometimes unsure if I can hear the demographic one. Listeners are unlikely to be taking GCSEs or even still to have young children themselves. They are hugely more likely to own their own homes rather than rent; and the vast majority will have paid off their mortgages. They may well be pleased when house prices and interest rates rise. It's just a matter of about thinking about life from the perspective of a fifty and sixty-something. That does not make it old-fashioned - it just makes it right. BBC Local Radio is quietly huge, with an audience in England of just under 7m mega-loyal listeners, almost the same reach as the mighty Capital network. It's rarely top of mind, however, not least because, for a variety of reasons, its profile is low in the cities where decision-makers live: London, Birmingham & Manchester. It deserves the bit of love it is now being afforded. 50+ is sadly unlikely to be a sustainable place for much commercial radio, so we must rely on the BBC to put its arm around the 19m people in the UK aged over 55, with the energy and focus with which the impressive Ben Cooper is attacking the 15-29s on Radio 1. 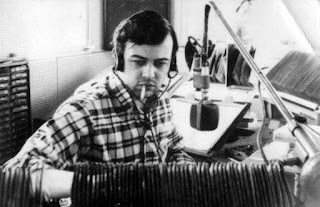 If the BBC hired sufficient gifted communicators of the right vintage, and a few folk who've 'lived' to handle the incoming calls - these stations will generate the 'warmth, personality and interaction' which David Holdsworth wisely seeks. My book 'How To Make Great Radio' is out now from Biteback. Proceeds to the Radio Academy.